"Hello, Liz here again with my final project for this month. 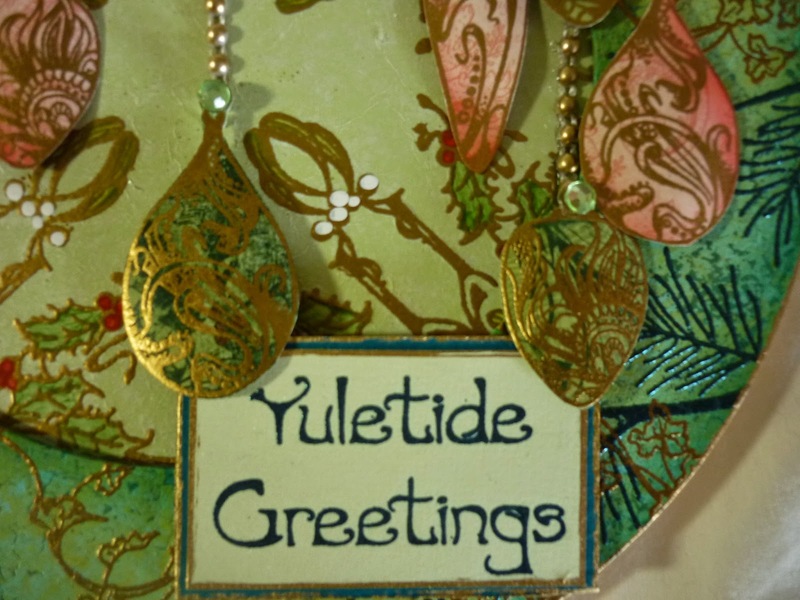 This wall hanging definitely has a feel of Christmas about it. I apologise if this is too early in the year for you but I became inspired by all the beautiful new stamps. I found a circular piece of MDF in my pile of "things to decorate" and a circular piece of heavy card that was exactly the same size. 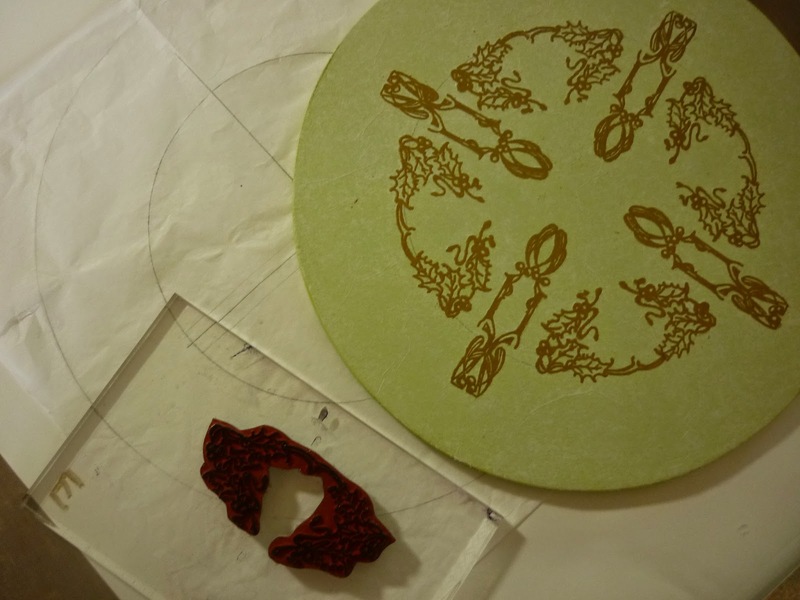 I was then able to use the card as a frame over the MDF base". 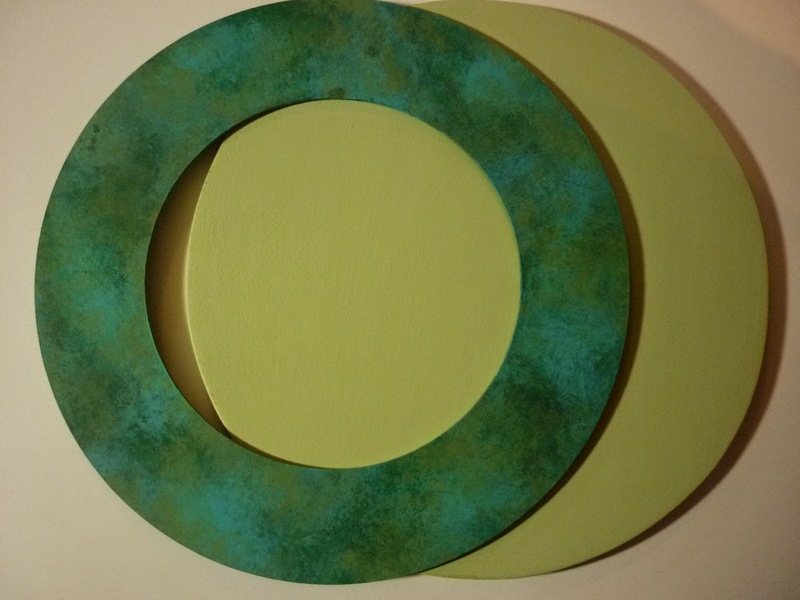 Firstly paint the MDF with Guacamole which has also been mixed with some Snowflake to lighten it. Paint both the back and the front as the paint seals the wood. 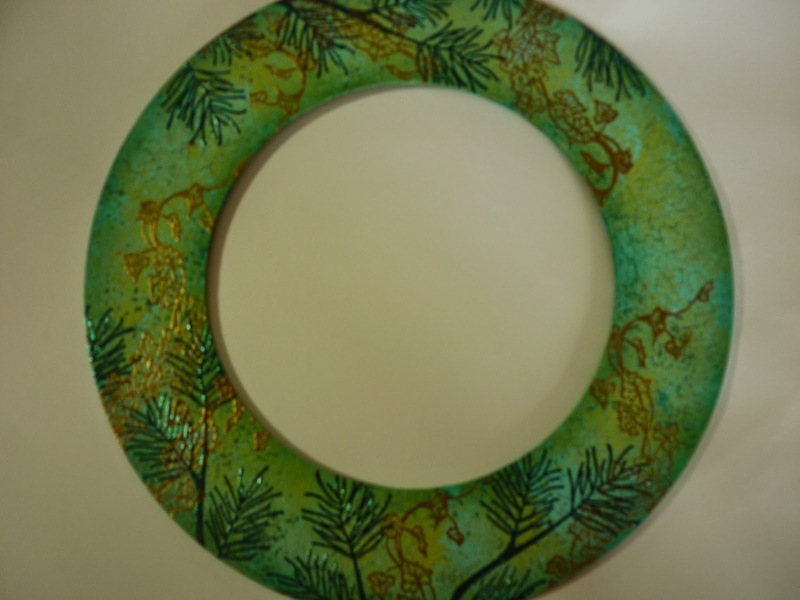 I painted the circular frame with a mix of colours, so in the picture it looks mottled. In fact I have realised that this was unnecessary as the frame only needs painting with a dark green, for example Hyde Park because I decided next to crackle on top, so the mix of colours isn't really noticeable. Dry the paint thoroughly. 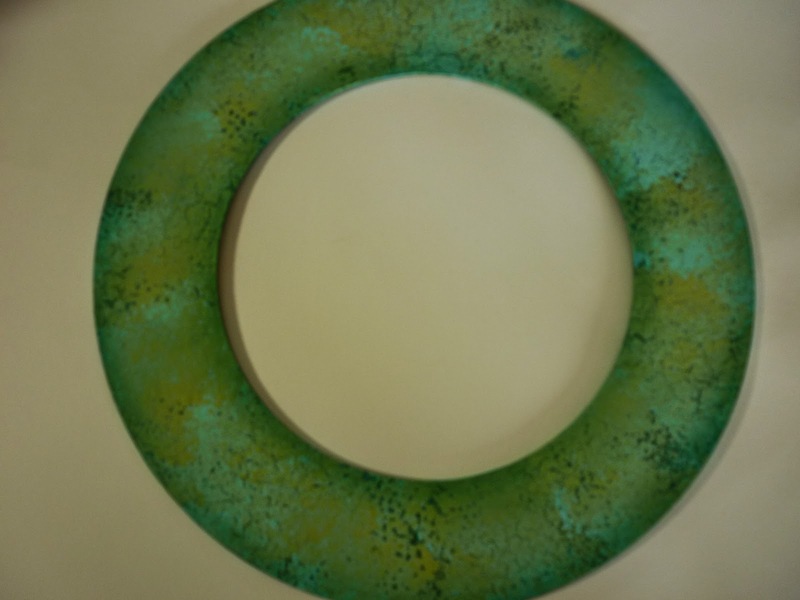 I wanted to create some texture on the frame and decided to use Crackle Glaze so the dark colour, Hyde Park is underneath, then a layer of crackle glaze, and then I would build up layers of paint on top. Instead of painting the glaze on with a brush I applied it randomly using a slightly damp sponge. The effect this creates is a very random crackle with no direction to it. The Crackle Glaze can just be seen in this photo. 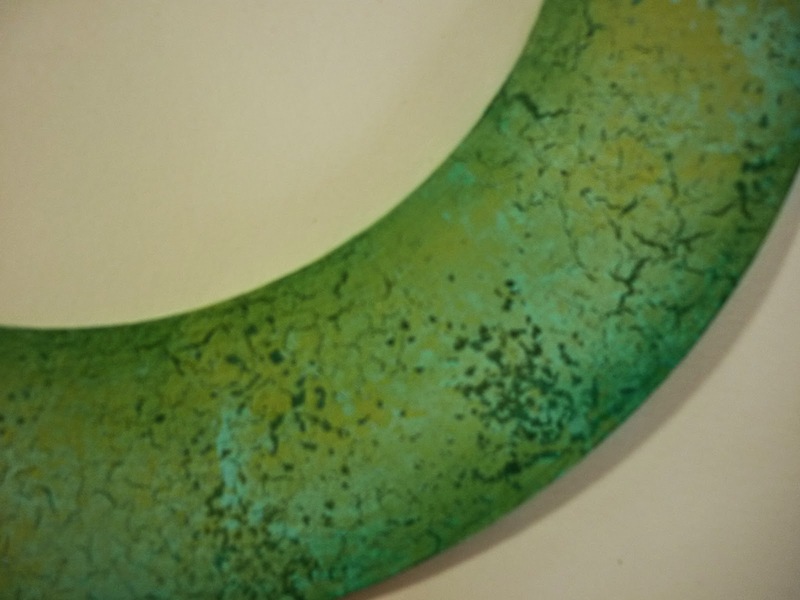 When the Crackle Glaze is dry apply your top coat of paint with a slightly damp sponge over the whole frame allowing some of the underlying green to show through. I used Guacamole and Bora Bora with some of each colour at each end of the sponge. This allowed me to apply one coat of colour at once and to get a random effect at the same time.It's a bit of a balancing act, as the paint need to be thick enough to react with the glaze underneath - the paint drying on top of the glaze start the chemical reaction of cracks starting to appear, so if you dab you paint on with the sponge too lightly, you won't get the top coats cracking at all. I wanted to create a background on the MDF inside the frame. I decided to stamp onto tissue paper so that I could get the placement of the images correct (I am not always good at getting correct placements of stamps and this allowed me to make a mistake without it being permanent). The easiest way to do this is to draw inside the frame with a pencil onto one piece of tissue paper and then place a second piece on top so that the pencil marks will not be on the final piece. 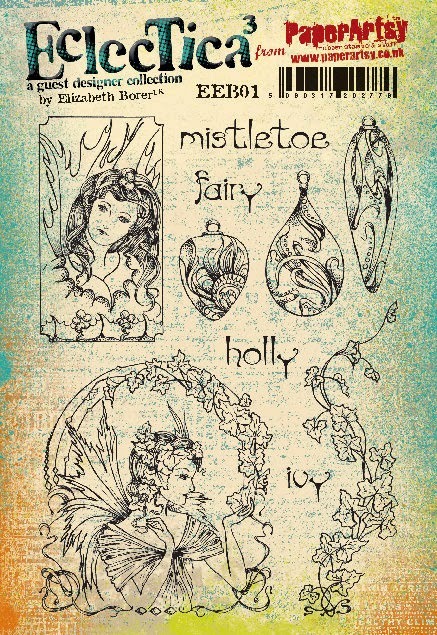 I then stamped and embossed with gold powder as seen using the mistletoe and the holly from EEB02. The center of the holly stamp is quite narrow so it can be bent slightly to create a curved image. When everything was stamped I adhered the tissue to the MDF using Matte Medium. Paint the medium over the base and carefully lower the tissue over the top. Another layer of Matte Medium can then be painted over the tissue to seal it. If you are careful you will be able to smooth out any wrinkles at the same time. 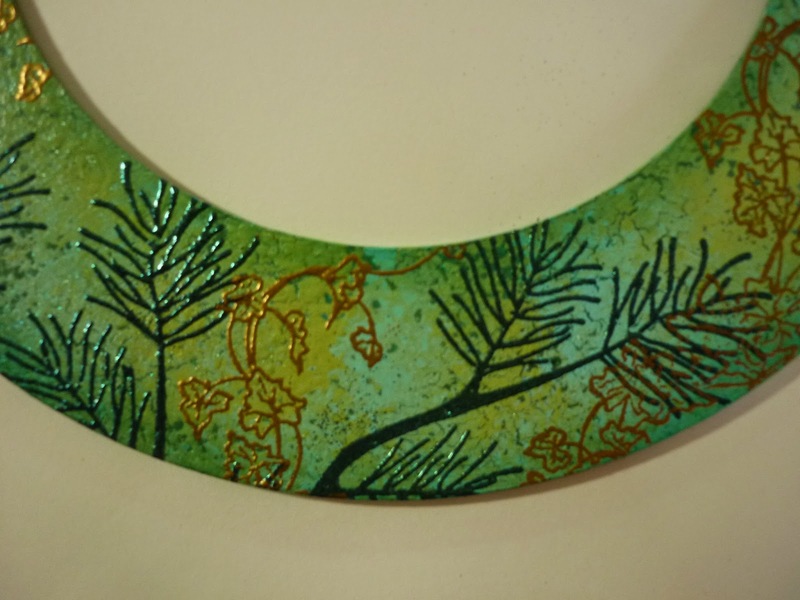 On the frame I stamped and embossed (with green powder) the fir branch from Lin Browns ELB10 and then used the ivy fromEEB01 to add to the design (this time using gold powder). The frame can then be stuck onto the MDF. 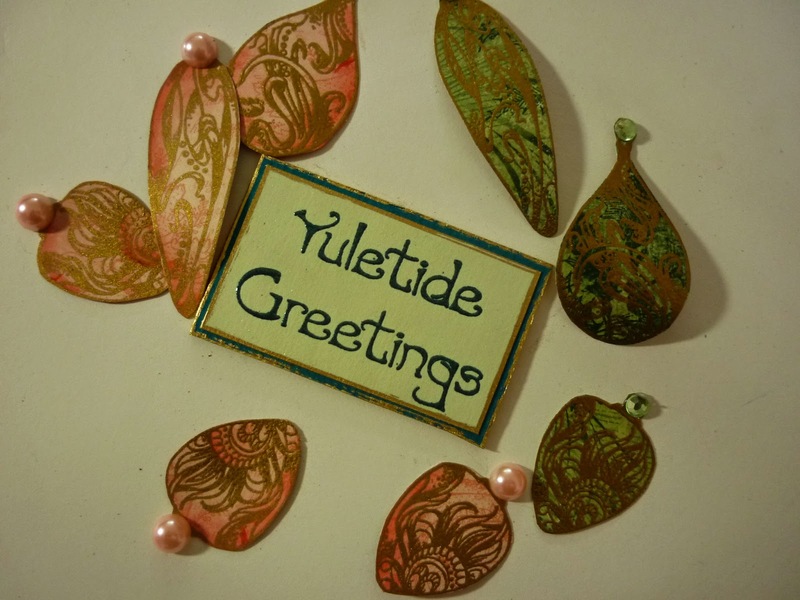 I stamped Yuletide Greetings onto some cream coloured card and embossed using black powder. I then rubbed Treasure Gold around the edge of the card and mounted it onto green card. More Gold Treasure Gold can be rubbed around the edges of this. This was stuck in place first so that the baubles can be lined up correctly. To create the baubles I stamped and embossed with gold powder onto some patterned paper so that there was a little design on the baubles. Any paper will do and the colours could be quite different. 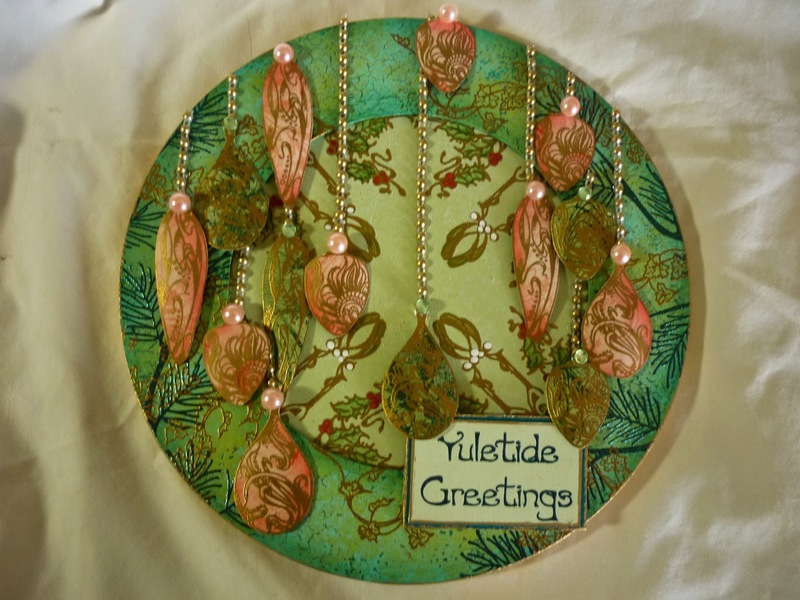 I cut out the baubles and stuck them in place using silicone or pinflair glue. 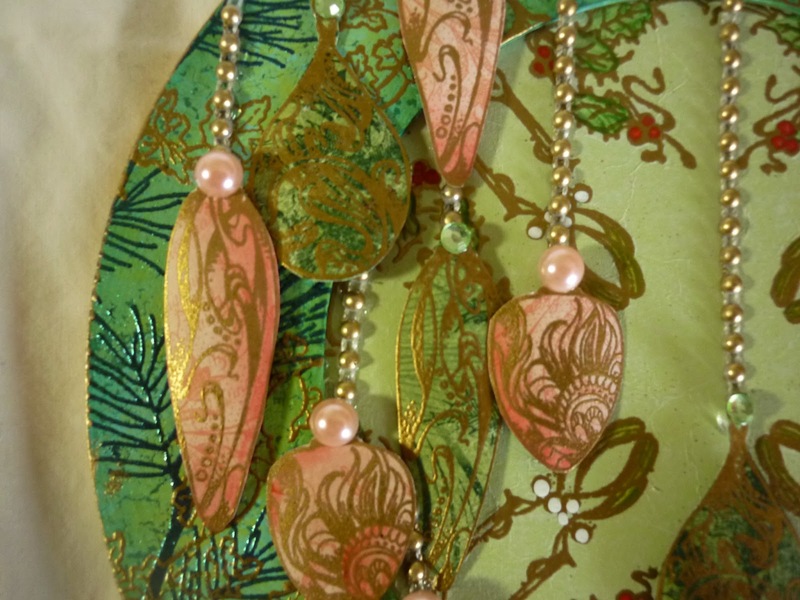 I had a chain of tiny plastic pearls and coloured it gold before sticking in place to create the strings of the baubles. Some large flat backed pearls completed the baubles. Well that’s all for this month. I have really enjoyed being back to show you some of my projects. I will be back again in November, so see you then . A huge thanks from all at PaperArtsy HQ Liz for a wonderful week of projects. The whole composition/transformation of the MDF shape is beautiful, again application of colour and depths of texture achieved is visually striking. I'm thinking earrings... Lovely make! Another beautiful project! I love the colours and all the embossing. 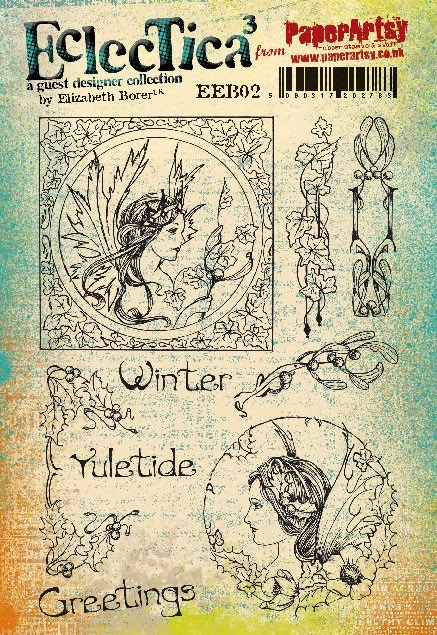 A beautiful Christmassy project Liz! I love the embossing! Very beautiful. The baubles look wonderful against the gorgeous background.